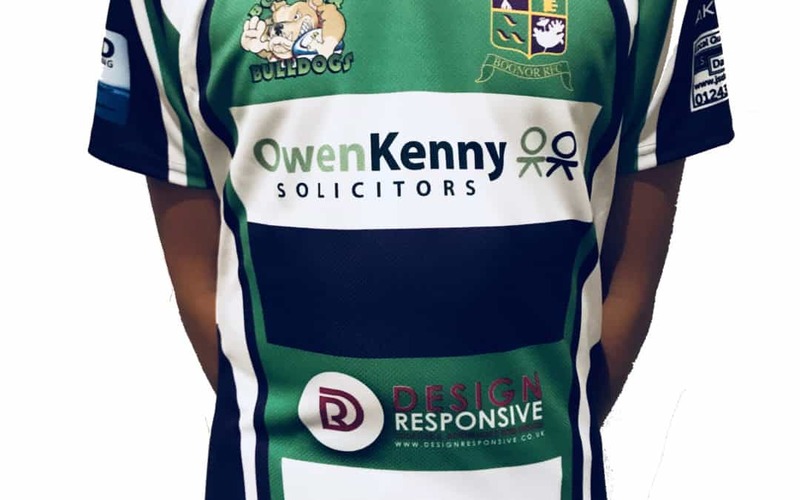 Design Responsive Web Design are proud Sponsors of Bognor RFC U13’s for the 2017/18 Season. The Squad have had a great start to the season and are playing better than ever. After a fantastic start to the 2017/18 rugby season with wins over Pulborough, Chichester and Haslemere, Bognor RFC Bulldogs (U13s) are certainly heading in the right direction. The performances on and off the field have attracted lots of interest from a number of businesses who were very keen to become the teams new sponsors. After dedication and hard work from Sam Pemberton and Craig Simmonds the team have just been handed a new playing kit for 2017/18 season. The coaches, players and parents would like to say a big thank you to all our new sponsors, Design Responsive Web Design, Owen Kenny Solicitors, Macleod Simmonds, Matform, BPD Plumbing, Monolution, JS Dalton and Faye Flinn. The sponsors really do keep the spirit off grass roots rugby alive and hopefully we continue to make good progress on the field and do all your businesses proud. Once again a big thank you to all our new sponsors and look forward to seeing you all at Bognor RFC. Design Responsive Web Design based in Chichester, West Sussex provide creative and affordable web design services across Sussex, Surrey and Hampshire. Whether you’re just setting up a new business or looking for a brand refresh we can help.